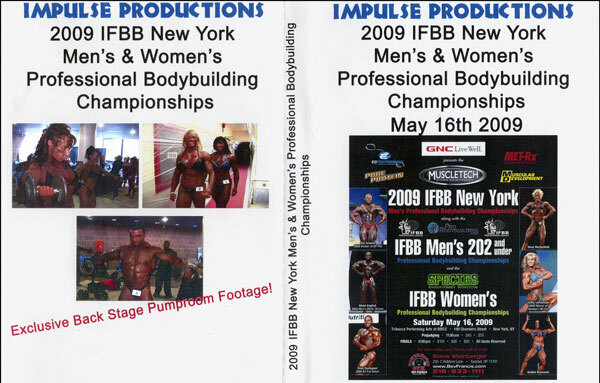 These championships were held in New York on May 16th, 2009 at the Tribeca Performing Arts Center. Centopani Wins In NY Pro, English Wins 202, LeFrancois Wins Women's. 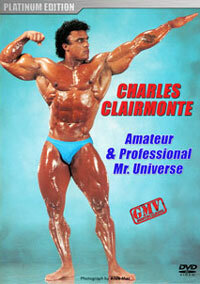 Classes included Men's and Women's Professional Bodybuilding including the 202 Class. See the complete contest from the beginning of the Prejudging to the end of the evening Finals with all of the posedowns and awards. 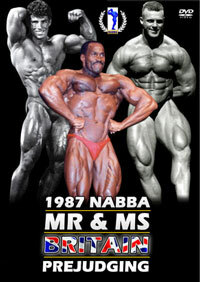 This extensive 2 DVD set also includes exclusive Back Stage Pumproom Footage! COMPLETE CONTEST RESULTS - See below. "Centopani Wins In NY Pro, English Wins 202, LeFrancois Wins Women's." 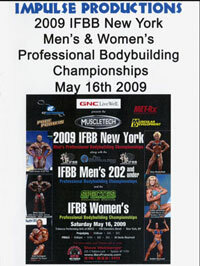 In an impressive debut performance, Evan Centopani has won the 2009 IFBB New York Pro. Thanks to a powerful combination of size, shape, conditioning and presentation, the 27-year-old made for a popular winner with the New York City crowd. Along with an Olympia qualification the rookie pro takes home a cool $15k and a hefty NY Pro ring. Coming in second was big Dennis James, who at 247 pounds was just a pound less than at the Arnold, but a whole lot tighter. Look for DJ to attempt to improve upon his placing in one to three shows (according to Dennis himself) prior to the Olympia. A chorus of boos resounded through the halls of the Tribeca Performing Arts Center when Marcus Ruhl was announced in third. 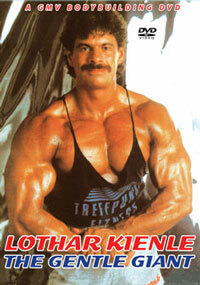 Always a popular performer, Ruhl didn't disappoint in terms of freak factor, but for fans of aesthetics, the Ruhl physique is lacking. A slightly off Silvio Samuel finished fourth, uncharacteristically smooth and seemingly tired, or possibly dejected over his early low callout. Hidetada Yamagishi, in one of his best performances to date, drew the last Olympia qualification of the evening, looking sharp and well-tanned. So, add Evan Centopani and Marcus Ruhl to this year's Olympia lineup in a show that's shaping up to be one of the most competitive in its 44-year history. FLEX would like to congratulate Evan Centopani on his win and congratulate promoter Steve Weinberger on yet another smooth and assured production here in New York, New York. In what turned out to be an extremely competitive 202 division, New York's own Kevin English has taken top honors for a second consecutive year. Despite an imbalance between his right and left legs and a slightly watery midsection English is mighty impressive, carrying what looks more like 220 than 202 pounds of muscle on his frame. 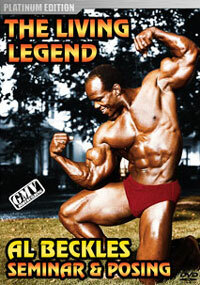 His chest is particularly improved and he sports an upper body reminiscent of the great Sergio Oliva's. Finishing second in his second consecutive show was Mark Dugdale, with a shaved head and excellent conditioning. 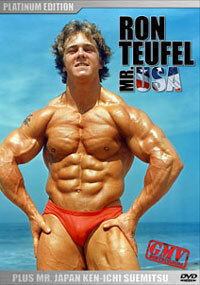 He'll never be the widest guy onstage, but when it comes to sharp muscularity he's hard to beat. Last year's runner-up, Dave Henry, accepted third place honors to a rousing chorus of boos. While he had his usual upper body thickness on full display, the conditioning wasn't enough to place him higher. 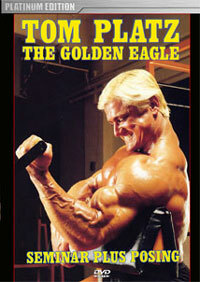 For a second consecutive year Kevin English has put himself in position as a favorite for 202 Olympia honors. We'll all have to wait and see if he can carry his mid-season success through September. In the women's competition Cathy LeFrancois repeated her victory here last year with a popular win in the Big Apple. With her good looks, refined musculature and omnipresent smile she won the hearts of the New York crowd and NY Pro judges alike. Taking the runner-up spot was 53-year-old Betty Pariso, who seems to be getting more muscular with each passing year. Right behind Pariso in third was the "Nubian Caribbean Queen", Rosemary Jennings, who is among the more muscular female competitors in bodybuilding today. With a polished presentation and no weak bodyparts she aslo put herself in good standing for the upcoming Olympia.